The European Union (EU) and WWF continue cooperation for sustainable resource use and protected area management. WWF and the EU have officially launched a project worth 2.8 million EUR (equivalent to more than 3.3 million USD) on 29th of March, to support the sustainable management of the rich forest resources of Mondulkiri province. 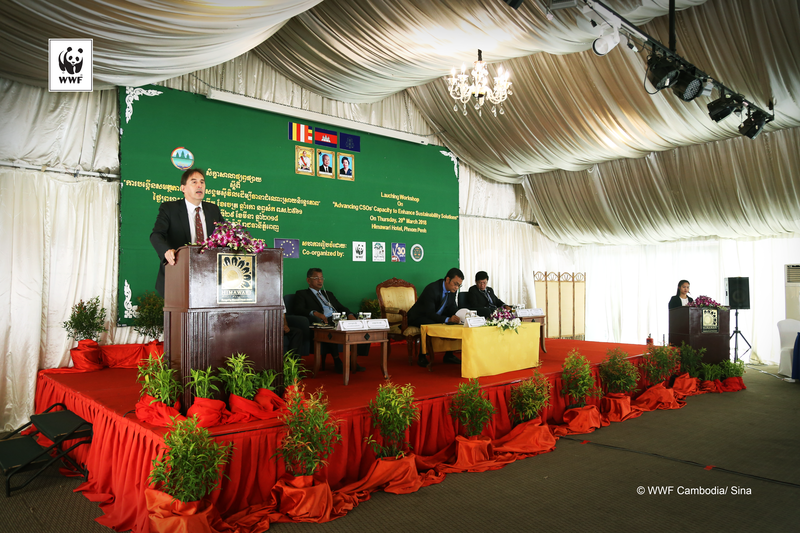 The five-year project (2018- 2022) is called 'Advancing CSO’s Capacity to Ensure Sustainability Solutions (ACCESS)', and its overarching objective is to strengthen the role and participation of Cambodian forest dependent communities through improved governance, inclusive policy dialogue, and conservation of natural resources in Mondulkiri province. The EU funded project, is to be implemented by a consortium of non-governmental organizations long operating in Cambodia, including WWF, Community Legal Education Center (CLEC), ADG and a local NGO called My Village Organization (MVi). This multi-partner approach is to ensure the active contribution of members of forest dependent communities in Mondulkiri province, as each organisation has specialisation in working with community protected areas (CPAs). “CPAs are like effectively living fences to protect our forests and biodiversity” said Seng Teak, WWF-Cambodia Country Director. “Engaging and empowering these communities to sustainably manage the forest resources, at the same time, increasing their well-being is the way forwards for natural resources conservation. We would like to see that target CPAs in PPWS and SWS are capacitated and empowered to exercise their rights to conserve natural resources through livelihood development, sustainable harvesting and law enforcement to build resilience for ecosystem services.” He also added that as a key implementing partner, WWF welcomes the support of the EU on this vital issue. The beneficiaries of the project are 2,000 households located in 34 villages inside two adjacent national protected areas, SWS and PPWS in Mondulkiri province. These two wildlife sanctuaries provide agriculture and non-timber forest products (NTFP)-based subsistence to over 30,000 people including 8,000 Indigenous people. The majority of these communities have been living in the region for generations, sustaining themselves through the forest and being directly responsible for the conservation of these forest resources, preserving biodiversity for future generations, educating and encouraging others to participate in natural resources conservation and sustainably using these resources for income generation.